Ants eat your crumbs. What’s the fuss? This is a post by our Research Associate Elsa Youngsteadt about her new paper in Global Change Biology. The first time we came back to an empty cage in Highbridge Park, I thought there was a problem. This was a cage cobbled together out of a fry basket from a restaurant supply store plus a square of hardware cloth, and it was firmly tacked to the ground with landscape staples. With its snug, quarter-inch mesh, it should let most insects move freely, while keeping vertebrates out. With holes any bigger than a quarter-inch, mice could squirm through. And they would want to, because the cage held a chunk of Nilla Wafer, a Ruffles Original potato chip, and a slice of Oscar Meyer turkey frank. Yum. 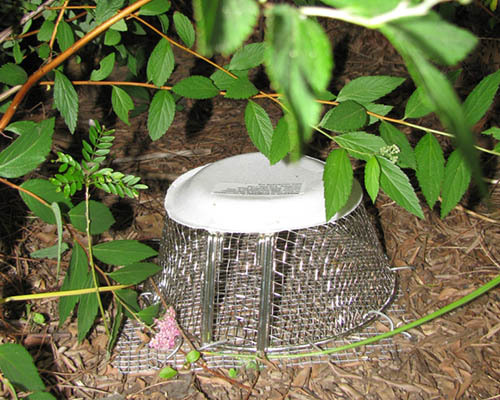 The purpose of the cage was to let us measure how much arthropods* alone were capable of eating in this Manhattan park, without interference from mice, rats, sparrows, and whatever other urban critters might shuffle by with the munchies. So I was dubious when we found an empty cage in Highbridge Park on the first day of our study. Could bugs alone have eaten our little pile of food in a day? When we did a trial run back home on the NC State campus, the food never disappeared completely like that. Had a mouse gotten in after all? Had a human passer-by toyed with our experiment? So we tried again. We moved our setup to a new spot nearby, tucking it discreetly among the trees and undergrowth behind the ball field. We fortified the cage until it bristled with cable ties and landscape pins. And came back a day later. This time, our arrival was timely. The cage was surrounded by a silent, busy swarm of pavement ants, trundling off the last fragments of potato chip, the last few cookie crumbs. Ants. Not mice, not tampering humans; ants. This was a scene we would see over and over in the next several days. And maybe we shouldn’t have been surprised. After all, ants are notorious visitors to kitchens and picnics, and they are incredibly important scavengers and hunters in natural habitats all over the world (except Antarctica). But it seems that I’m not the only one impressed by our tiny urban neighbors. Our study of garbage-eating ants was published today in Global Change Biology, and The New York Times, The Washington Post, National Geographic, and Wired have already published their versions of the story. More news in the works from Germany to South Korea, and I’ve described our study to more than a dozen reporters this week. This process has been delightful and a little exhausting and even puzzling. I mean, sure, I was surprised when ants cleaned up the food the first time—but everybody else is amazed, too? It’s news that ants eat crumbs? Or is it news that some scientists were nutty enough to weigh hot dogs and potato chips and set them out in experiments around the most densely populated city in the US–in Central Park, in the middle of Broadway, in view of the Statue of Liberty? 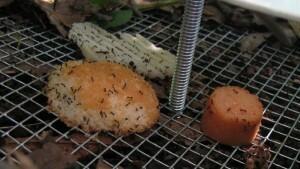 Or is it news that ants are competing with rats for this junk we drop? That this little drama plays out over the crumbs to which we never gave a second thought? Bugs in street medians ate two to three times more junk food than those in parks. Street medians are little strips of trees and groundcover planted between lanes of traffic, and they host fewer ant species than do parks. Ecological theory predicts that more diverse ecosystems are more efficient, so we were surprised that bugs in medians ate more than those in parks. We indulged in some extrapolation and calculated that the bugs inhabiting the 150 city blocks of medians on Broadway and West Street are capable of eating more than a ton of food per year–the equivalent of 60,000 hot dogs. Bugs compete with vertebrates (rats!) for our food garbage. Alongside our cages, we offered a second set of uncaged foods, available not only to bugs but also to any hungry vertebrate. More food got eaten from this open treatment than from the cage. That means that both groups of animals (bugs and vertebrates) want the stuff we drop. In other words, they compete for it; what one group gets, the other group doesn’t. 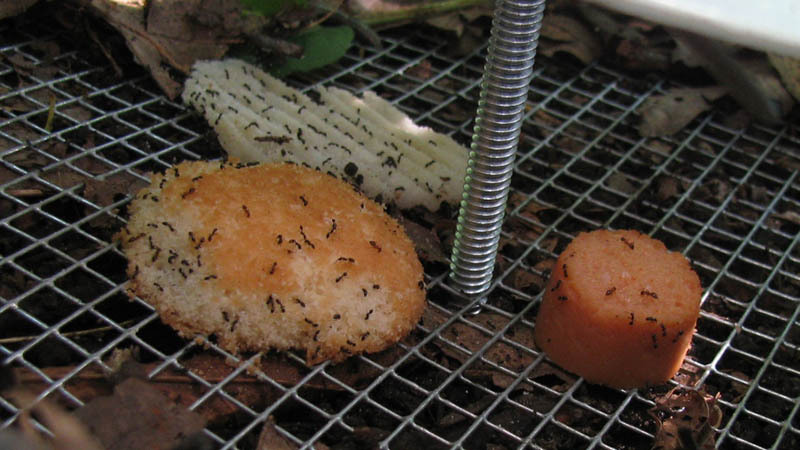 I would love to know how much of that uncaged food went to ants and how much to rats–and whether that depended on the kind of food, the size of the food, the time of day, the habitat… But those are goodies for another study someday. Hurricane Sandy was a disaster, but not for garbage-eating bugs. Several of our study sites were inundated with saltwater during Hurricane Sandy, seven months before our study. We thought this would matter to the wildlife. But we detected no effect of flooding on how much food got eaten. Maybe there was still an effect on some kinds of bugs—we’re still figuring that out—but certainly not on those that eat our crumbs. I admit I’ve often tossed an apple core into the woods, not even thinking of it as litter. It’s “biodegradable,” so it doesn’t count, right? Now, my friends, we have met our urban biodegraders. To them it counts, and their work behind the scenes is making our garbage disappear. 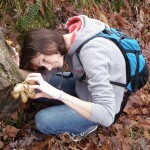 As an insect ecologist, I am interested in plant-insect interactions and their responses to human modified environments. Plants and insects diversified together, producing the fascinating array of interactions we see in the world today—from seed dispersal and pollination to herbivory. My current research asks how urbanization and climate change alter plant-insect interactions, using scale insects and their host trees as a study system. I am comparing scale-insect abundance across urban, latitudinal, experimental, and historical temperature gradients. My other ongoing projects examine arthropod diversity and function across New York City green spaces, and the effects of Hurricane Sandy on New York’s urban insects. Ultimately, my goal is to understand how human activities, including both urbanization and restoration, can be guided to preserve a diversity of plants, insects, and their interactions.